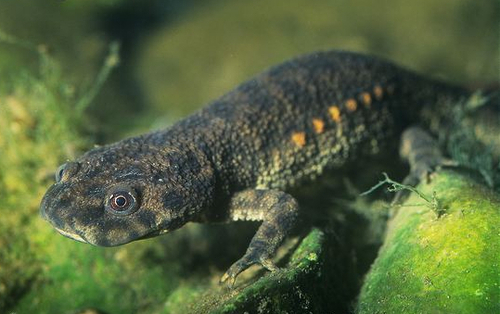 Today, I want to write about a very unusual amphibian, the Iberian ribbed newt. This large salamander grows up to 30 cm long. Iberian ribbed newts are often used on space missions to see how they develop in those situations. They have been on six missions so far. They have a very unique defensive technique. They have warts down their side that their ribs can burst through when they are attacked. At the same time, they secrete poison that coats their ribs, making them even less tempting to potential predators. This doesn’t seem to hurt the newt and they have a strong immune system that helps the holes to heal quickly. At breeding time, they lay between 200-1000 eggs in clumps of 15-20 on plants, branches and rocks below the surface of the water. Also known as the Spanish ribbed newt, they live throughout Spain, Portugal and Morocco and are considered near threatened due to habitat loss and the impacts of invasive species. Are there any other interesting facts that you would like to share about Iberian ribbed newts?